Master Chung Kwang Tong, Taoist Name “Wei Yi”, is a Taoist priest of the 34th generation in the lineage of the Dragon Gate Sect of the Complete Perfection Tradition. 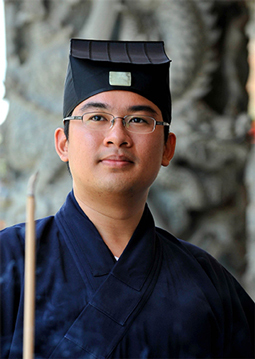 Master Chung started practicing the Taoist scriptures and the traditional rituals since 2000, at the age of 16. Ordained in 2003 at Singapore Hiang Tong Keng temple, he is a formal disciple to distinguished Hong Kong Taoist master, Master Leung Tak Wah, the Chairman of the Hong Kong Taoist Association and Vice-Chairman the Fung Ying Seen Koon (Hong Kong). Master Chung is the administrator for the Singapore Taoist Federation, and the Secretary-General of the Taoist Federation Youth Group (Singapore). He was a also a member of the Inter Religious Harmony Circle (IRHC), and he is currently a council member of the Inter-Religious Organisation (IRO), Singapore. He actively participates in local and international intra-faith and inter-faith engagements, and represented Singapore in several interfaith dialogues such as the ASEM Asia-Europe Youth Dialogue 2008 and Second Asia-Europe Youth Interfaith Dialogue in 2008, and the ASEM Interfaith and Cultural Retreat for Religious Leaders in 2009. Being an ordained Taoist priest who is bilingual in English and Mandarin, Master Chung shares the ancient Chinese religion with the English speaking world. He is also the lecturer (Taoism) for the Catholic St. Francis Xavier Major Seminary in Singapore and conducts regular talks at the National Community Leadership Institute (NACLI), and for the Inter-Racial and Religious Confidence Circles (IRCC). Welcome to the blog of Master Chung Kwang Tong (Wei Yi), a Singaporean Taoist priest of the Quan Zhen Longmen Tradition. Master Chung is formal disciple to Master Leung Tak Wah, the incumbent Chairman of the Hong Kong Taoist Association.